Early 20th c. onogram "CM"
Monogram "CP", embroidered in Germanic style letters in a very important relief of bourdon. Monogram "CR" encased in a frame of embroidered pearls and embellished with pretty open-faced daisies. 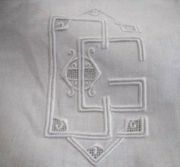 Monogram "CS", embroidered in fine bourdon and post point, entwined and superimposed.